Waterville Valley is a quaint oasis in the mountains, but the dining selections outweigh its size. 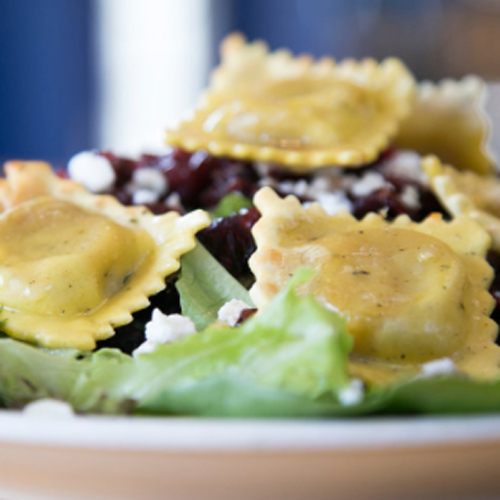 From gourmet fare from Johnson and Wales trained chefs to simple pizza and salads, Waterville Valley has something for every taste and wallet. Offering you creative and exciting dishes in pasta, fresh seafood, grilled steaks, and other great dishes, the Coyote Grill continues to keep you on the cutting edge of new cuisine. Chef Sean Stout provides you with the finest in food and service. Enjoy your dinner in the Coyote Den while overlooking the breathtaking views of the surrounding mountains. Maybe even see a moose grazing around Corcoran Pond! Built from the lumber of a 200 year old local barn, this rustic looking and feeling dining area makes a perfect place for your wedding reception or next business function. Chef Sean's achievements include distinguished five star ratings at several New England restaurants, appearances on television culinary shows, and personal appearances for major culinary retail outlets. Waterville Valley Resort is excited to announce the addition of a new restaurant in Town Square this winter. La Hacienda Mexicana, a family-owned and operated restaurant, will be open for the winter season and will feature authentic Mexican cuisine. Some of the authentic fare offered include Guacamole de Molcajete (fresh guacamole prepared tableside), Mole Poblano, Fajitas, Arrachera (skirt steak served with rice, beans and pico de gallo). Signature desserts include flan and helado frito, fried ice cream. 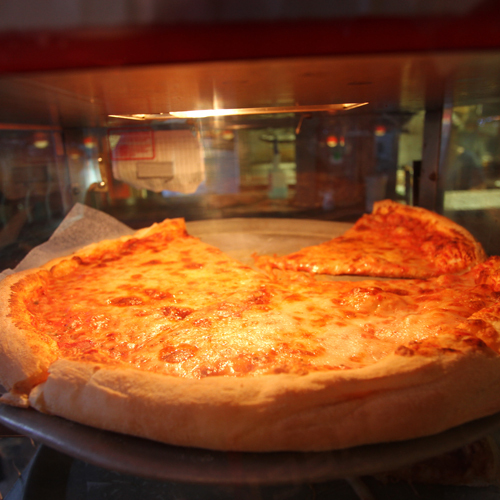 The Olde Waterville Pizza Company has been a local favorite dining spot since 1989. Located on the lower level of Town Square across from Legends 1291 Sports Grille the Olde Waterville Pizza Company in its casual dining atmosphere attracts anyone and everyone who loves pizza! Using the freshest ingredients and top-quality cheeses and meats, the Olde Waterville Pizza Company offers variety and the best value around! Enjoy fresh baked pizza, subs, burgers, pasta, salads, appetizers, and so much more, including a small game room for the kids. The Olde Waterville Pizza Company with their friendly staff always invites you to take out or better yet, dine in! Located just off of Corcoran Pond in Waterville Valley, Mulligans Tap Room & Eatery offers a comfortable family atmosphere to enjoy a delectable meal. With the big game on multiple TV's, play darts or just relax while you take in the views of the White Mountains from the comfort and warmth of our restaurant. Open for breakfast, lunch and dinner. Legends 1291 Sports Grille is Waterville Valley’s longest established restaurant! Restaurants come and go, but Legends 1291 since 1989 remains a favorite with locals and guests from out of town. The friendly staff at Legends is always happy to serve you in their fun, festive atmosphere. They offer fabulous, fresh, family favorites from burgers to ribs, from pasta to salads, from subs to tenders and all your favorite apps. With 7 TV’s including a huge 12-foot screen, Legends shows all the games, and for the kids, Legends has basketball, fooseball and plenty of video games! Enjoy Legends inside, or outside on the scenic deck overlooking Snow’s Brook, and don’t forget to catch the great Legends DJ’s on the dance floor every Saturday night! Come on down to the lower level of Town Square and enjoy our renowned hospitality. Located at the Club House at the Waterville Valley Golf Club, the Grill serves breakfast and lunch (in season). Breakfast features eggs (any style), egg sandwiches and omeletes, while our popular lunch menu includes egg salad and ham salad sandwiches, grilled cheese, BLT, tuna melts and sweet sausage sandwiches. Take a break from your day on the course and enjoy a meal with a view. Open to the public. La Tasse, a 25 seat cafe, is open in the Town Square next to The Bookmonger and Toad Hall Toys. La Tasse offers specialty coffee as well as a variety of loose leaf teas, chai tea, hot chocolate and pastries each morning. During the afternoons, selections will also include local beer and wine and small dish entrees such as quiche, meatballs, savory fold overs, soups and salads. 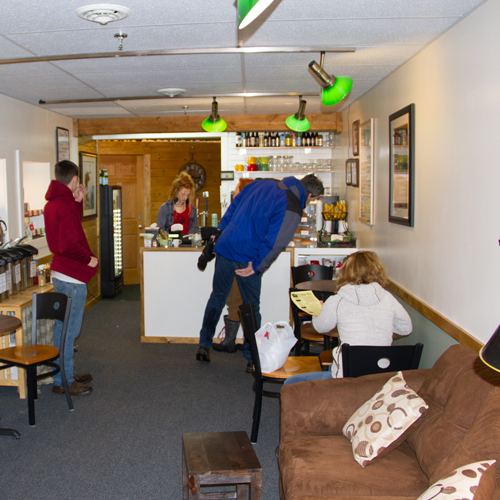 We look forward to welcoming you to our cozy, firelit location as part of your visit to Waterville Valley. The Marketplace is the place to go for quick eats. Serves up breakfast sandwiches made to order, home fries, warm muffins, and bagels until 11am daily. Guests can stop in at lunchtime for a classic burger and fries, pizza, deli sandwiches made with all natural and nitrate free ingredients, a burrito bar, and delicious homemade soups and chili. Check out the soup of the day served in a warm bread bowl. Conveniently located on the 2nd Floor of the Base Lodge. Open daily during the winter season 30 minutes before & after lifts operate. Getting rave reviews are the T-Bars creative oven baked sandwiches like Jack's Outback (melted brie on multi-grain with sprouts, spinach and tomato dressed in parmesan vinaigrette) and Maxwell's Mogul (Reuben with turkey, ham, sauerkraut and Thousand Island dressing). T-Bars is THE place to go for après ski with live entertainment on weekends, après ski menu, and tons of fun promos. Besides tasty food and fun events, T-Bars is a great destination where guests can observe the history of Waterville Valley Resort. T-Bars walls are covered with rare pictures, equipment, and other archive items from the 60s, 70s, and 80s. T-Bars is open during the winter season daily 11:00 am till the last guest.